Andrea Candell, HJ Minton and Hillary Koritz-Price started d2 Drive/Define, a California-based company, to fulfill a very specific need: a lightweight bag that works for both a bike ride and dinner at a trendy restaurant. Their versatile bag works across the body, as a hip belt (aka, trendy fanny pack), clutch, or small accessories/make up bag when you’re travelling. I, personally, love this concept. You’d probably be surprised to hear that there are not very many options out there in the purse market for people who want an everyday clutch-sized across the body bag. Trust me, there isn’t. I’ve been looking for one since my last one “died” (roughly six years ago…). I now have the d2 Drive/Define “Black with Red Zip”. This little red and black number is stylish enough for shopping or the pub. It has two pockets inside. They’re a bit loose for my taste. I prefer the snug pockets so my items don’t move around a lot (again, personal preference here). There’s a divider down the middle to keep your keys away from the more fragile items in your bag (phone, sunglasses, scratch-able surfaces). Though you could alway just put your keys in one of the smaller pockets. The easy-to-adjust strap does exactly what they claim – gives you options on how you want to wear it. When it’s at its full length, it hangs to my hip (taller women may find it resting on their waist). Because the bag is on the smaller side (6” x 9”), it’s impossible to fit a water bottle in there. This is why Candell et al. developed their d2 Drive/Define Hydrate Holder. 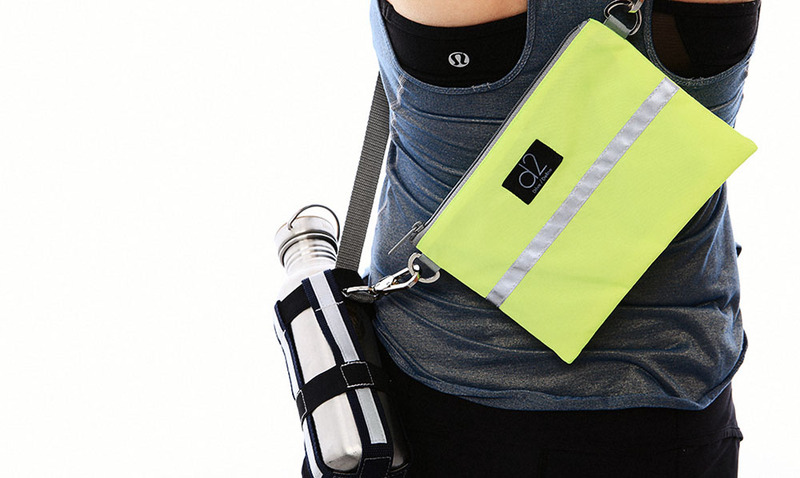 It’s a fairly simple concept – reusable and moveable bottle holder that you can attach to any strap. The 2.75” x 7.25” body is made of good quality nylon webbing. An elastic band around the middle and top gives you a bit of leeway for the size/width of your water bottle. Velcro strip holds fairly securely. I’m not confident in velcro; I would have preferred a buckle or clasp, but those options also may have limited the adjustable nature of the holder. Reflective panels on the sides are a nice touch, especially for runners/walkers/people who go outside. Overall, nice design, quality materials, and it does what it’s made to do.